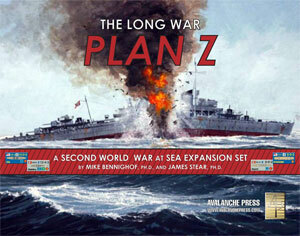 The Long War setting – which includes Second World War at Sea: Plan Z - posits a Second World War that took a somewhat different turn, resulting in a longer conflict (naturally) involving a much greater naval aspect (because it's a setting for our Second World War at Sea series). The late-war technologies like jet aircraft get to play a larger role, as well as warships not finished in time to see meaningful action in the actual war. With a war lasting even longer than the six dreadful years of the real thing, the world of the Long War is a pretty dismal place. Nazi Germany has even longer to inflict its evils on its chosen victims. The war itself will be even more difficult for the forces of democracy and freedom, as the powerful Red Army has been eliminated from the battlefield. The setting was never intended to represent a likely outcome of history; it began with the question of, “under what circumstances would Nazi Germany have been able to complete the massive Plan Z for fleet expansion, and use these ships in a naval war?” That was a highly unlikely situation: Germany lacked the resources to build such a fleet, the time in which to build it, and faced far too many other military challenges to allow what time and resources were available to be allotted to naval construction. So the setting would have to give Germany more time, more industrial power, and fewer enemies. So the preamble to our story begins with Poland and Lithuania accepting Germany's offers of alliance and close military cooperation in the spring and summer of 1939. The Soviet Union's demands for basing rights in Latvia, Estonia and Finland are rejected, sparking a wider Winter War than occurred historically, prompting Swedish intervention. When the Red Army remains bogged down as the spring thaw occurs, Germany and her Polish allies strike east in May 1940. Japan, Italy and Romania all eventually join the attack as well, and by the summer of 1942 the Soviet Union has been defeated. France, Denmark, Norway and the Low Countries fall as well in the months that follow. By the spring of 1943, Britain stands alone. Things aren't much better for the forces of good in the rest of the world. In the Mediterranean, Italy has built up her fleet and air power, and unleashes them against British supply lines and the island fortress of Malta. Japan has refrained from invading China, and secured her northern frontier with an invasion of the faltering Soviet Union. Taking advantage of British distress, she occupies French and Dutch colonies in late 1942, provoking sharp American protests. Seeing war with the United States as inevitable, the Japanese strike first with their vastly augmented First Carrier Fleet. In our Plan Z narrative the Germans open the naval campaign against Britain fairly tentatively, as they did in the actual conflict. Germany's Supreme Leader alternates between raging that the expensive “luxury fleet” is doing nothing to win the war, and raging that the irreplaceable battleships and cruisers are being needlessly risked. Despite the politically-induced stop-and-start nature of operations, eventually the Germans are launching operations deeper into the Atlantic. The Royal Navy hasn't been idle during the four additional years of peace granted by this alternative reality: older warships have been modernized, and new ones completed. No longer do British aircraft carriers operate biplanes; modern attack planes and fighters crowd their decks. The Royal Navy is strong and holds a serious edge in fighter power over the German Kriegsmarine, even with the completion of Plan Z. While there are operations on the periphery of the main event, both sides know what has to take place: the British must maintain convoy traffic to and from Great Britain, and the Germans must stop them. That results in climactic battles out in the gray wastes between high-speed raiders and the British battleships and cruisers escorting the convoys. The older British battleships are slow and often weakly-protected, even after modernization, but they don't have to maneuver long distances as long as they place themselves between the enemy and those they are protecting – and since the crews and commanders are British, that's what they will do without hesitation. And there are carrier battles – the Germans have a half-dozen fleet carriers and can present a serious challenge in the air as well as at sea. The Germans have the very effective Me155 carrier fighter, a highly modified version of the Bf109g land-based plane. Their attack squadrons have the Ju87 “Stuka” dive bomber, but do not field a torpedo plane. The British have even more carriers, adding six fleet flattops in the Plan Z set to those already present in the Bismarck and Arctic Convoy games. Their fighter squadrons are a match for those of the Germans, with the Seafire, a navalized version of the famed Spitfire. The British have no dive bombers, instead relying on torpedo bombers in the shape of the Fairey Barracuda, a much more effective plane than the Swordfish and Albacore biplanes of the actual war's early years. One of the big, new British carriers has an even more effective air wing: American-made Hellcat fighters and Avenger torpedo bombers, each with three times the range of comparable German or British planes. But Lend-Lease has not occurred in this reality, and such planes have to be purchased with hard currency, making them precious and rare commodities. As the Plan Z narrative comes to a climax, the Germans have inflicted serious losses on the British convoy traffic – they may be out-gunned and out-numbered, but there's a lot of empty ocean in which to hide and they have the speed and reconnaissance assets to mass what force they do have at critical points. The Germans are attempting to out-flank the British Isles to the north by mounting operations against Iceland, the Faroe Islands and the Shetland Islands, seizing new bases far closer to Britain and her vital trade routes. The British are going to need help to avoid a German conquest. And in the next volume of the Long War series, they're going to get it.